With Billions At Stake, Supreme Court Rules States May Tax Online Retailers States will reap billions after a major ruling that says states may now impose sales taxes on Internet retailers, even ones out of state and with no physical presence in the state. Home goods seller Wayfair and other e-commerce companies had attempted to challenge a South Dakota law that levies taxes on purchases made through certain online retailers. Those earlier decisions, one half a century ago, the other a quarter-century ago, date back to a time when mail-order sales were relatively small and online sales were all but nonexistent. As the justices acknowledged Thursday, however, the court back then "could not have envisioned" a world in which e-commerce sales have revolutionized the dynamics of the national economy. Writing for the five-justice majority, Justice Anthony Kennedy said that the previous decisions "were flawed," and in the modern economy, they "create, rather than resolve market distortions." In today's context, he said, the physical presence rule is "an extraordinary imposition by the judiciary on the states' authority to collect taxes and perform critical public functions." Furthermore, Kennedy said, the previous decisions effectively functioned as a "judicially-created tax shelter" for out-of-state retailers, and put local businesses at a "competitive disadvantage." The problems with these earlier decisions, Kennedy said, were made "all the more egregious" by technological innovation. "The Internet's prevalence and power have changed the dynamics of the national economy," he wrote in the majority opinion. The 5-to-4 decision defied the usual conservative-liberal lineup, with Kennedy joined by liberal Justice Ruth Bader Ginsburg and conservative Justices Samuel Alito, Neil Gorsuch and Clarence Thomas. In a separate concurring opinion, Thomas expressed regret that he had not supported overturning the earlier decisions in 1992, when the question was last before the court, and he was in his first year as a justice. The conservative chief justice, John Roberts, dissented along with liberal Justices Stephen Breyer, Sonia Sotomayor and Elena Kagan. Writing for the dissenters, Roberts agreed that the earlier decisions were wrongly decided. But he said that any disruption of long-established rules governing a critical segment of the economy should be undertaken by Congress. "The Court should not act on this important question of current economic policy, solely to expiate a mistake it made over 50 years ago," he said. The decision was a victory for South Dakota, which, like some other states, has no income tax and relies on sales taxes to fund most of the state's services. Because of dramatic fall-offs in state sales taxes, the state in 2016 enacted a law to test the physical presence rule. 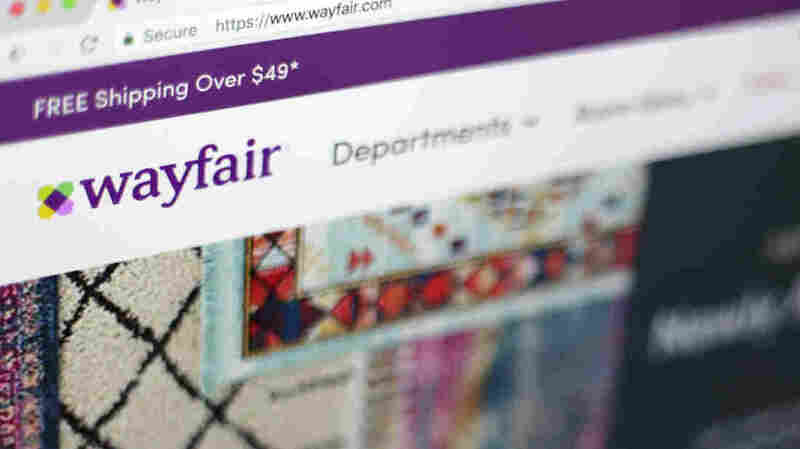 Three large online vendors, Wayfair, Newegg, and Overstock, challenged the law in court, and lost on Thursday. "It's a great day for South Dakota and Main Street America," said South Dakota Attorney General Marty Jackley. He said that the court's decision would result in "48 to 58 million dollars that South Dakota can use for education, healthcare, and infrastructure." But it's also "much bigger than that," Jackley said. "It's going to revive Main Street South Dakota and Main Street America." South Dakota State Senator Deb Peters, President of the National Conference of State Legislatures, noted that small businesses have faced an uphill battle against out-of-state vendors, who have been able to charge lower prices because they didn't have to collect sales taxes. She pointed to a local shoe store, for example. "The storefront on Main Street is paying property taxes in their local community; they're paying the person that's helping you try on the shoes, and they've got to pay for the inventory," she said, but they lose a lot of sales because people know they can buy the same shoes online without paying taxes." While some online sellers recently have started collecting sales taxes, others, like L.L. Bean, do not. Amazon does collect on direct sales, but not indirect sales. That is likely to change now. Twenty-four states have already agreed to a streamlined proposal for vendors collecting sales taxes, but some of the most populous states – New York, Texas, and California – have until now refused to sign on, and have far more complicated tax collection systems. Congress, as the court acknowledged, could enact a broad-based law for state sales tax collection. But anti-tax groups and Republicans in Congress have bottled up such proposals. Thursday's victory for South Dakota would seem to flip the script, with states less interested in enacting some sort of national legislation, and online vendors perhaps more interested. "The chessboard just looks a lot different now," said Stephanie Martz, general counsel for the National Retail Federation, which includes 18,000 businesses large and small. "Now our members are going to be able to figure out how to construct their businesses without worrying about whether putting a distribution center on this side of a state line or that side of the state line will result in a different tax implication." While the court made clear that the states do not have unlimited power to require sales tax collection, "The court blessed South Dakota's law," said Carl Davis, research director for the Institute of Taxation and Economic policy. The law specifically protects small businesses from collecting sales taxes if they have less than $100,000 in sales as well as fewer than 200 transactions in the state. The state also provides sales tax collection software for free for any business that wants it, and using that software immunizes the business from audit liability. Perhaps most importantly, the state law does not permit sales tax collection for past purchases, meaning that businesses don't have to worry about a huge tax bill that they never anticipated. State Sen. Peters, a Republican, has long been active in pushing for a system that forces retailers to collect state sales taxes. She recalled Thursday that she started looking at this issue in 1992, when the Supreme Court in Quill v. North Dakota reaffirmed that out-of-state vendors did not have to collect sales taxes. Back then, "I was a junior in high school," she said, adding that her youngest son just finished his junior year in high school. "The world has changed," she said with a smile. "And it's about time." A previous version of this story incorrectly described which businesses the South Dakota law applies to. According the Supreme Court ruling, the law covers sellers that either "deliver more than $100,000 of goods or services into the State or engage in 200 or more separate transactions for the delivery of goods or services into the State."